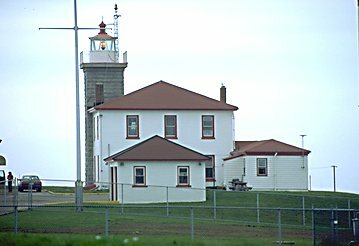 The original Watch Hill Light was built in 1808 and was replaced in 1856 with the current granite block tower. A fourth order fresnel lens is still active. Why "watch" hill? The area got its name during King George's War, in the 1740's when a watchtower was built on the hill to warn against naval attack. You can find the light by driving south on 1-A just east of the Connecticut/Rhode Island line. Park your car in the town of Watch Hill and walk up the hill on the ocean side of town. The public access road to the light is hidden among the opulent oceanfront houses perched on the hill. With persistence, however, you can visit the light without trespassing.